We've been back here a week, enjoying Jolly Harbour and doing lots of boat chores. We hope to get the teak refinished before we head home from Grenada in the spring so that is the focus of our days. Pam scrapes and sands while Glen does crosswords and fetches drinks when they are needed. We decided to rent a car so we could drive Pam out to the airport in the morning. She is heading home for 10 days of "Gran-time," with Jackson, Lucy and Chevy. We got the car the day before and set out to explore with Richard and Jan from Morpheus of London, an IP 370 we've bumped into in various places. We took a test run to the airport to make sure we could find the way. Turns out we couldn't and got lost. So after a big DUH! moment we found the airport, put that behind us and headed out to Falmouth Harbour, home of some magnificent yachts. We thought we would be restricted onto the dock but we must look yachty enough as we were able to walk alongside some of these behemoth yachts. Unbelievable. After lunch we carried on to English Harbour, home of Nelson's Dockyard. In the late 1700s Nelson was responsible for enforcing the "Navigation Act" which put him in charge of the surrounding area and the harbour. The dockyard was kept busy refitting English ships sailing and trading in the Caribbean. He was under the command of Sir Richard Hughes - who had just blinded himself in one eye chasing a cockroach with a fork. Hate it when that happens!!! Nelson went on to distinguish himself (and die) at the Battle of Trafalgar. The dockyard is amazing. Many of the old buildings have been restored and gentrified. The old Admiral's mansion is now a beautiful boutique hotel. So Pam has gone home... Glen is in Antigua working hard... sanding, painting, cleaning, scrubbing. BTW, no new photos for the next 10 days. Pam took the camera. We'll have to use file footage. We've enjoyed our time in St. Kitts. But it is time to move on. 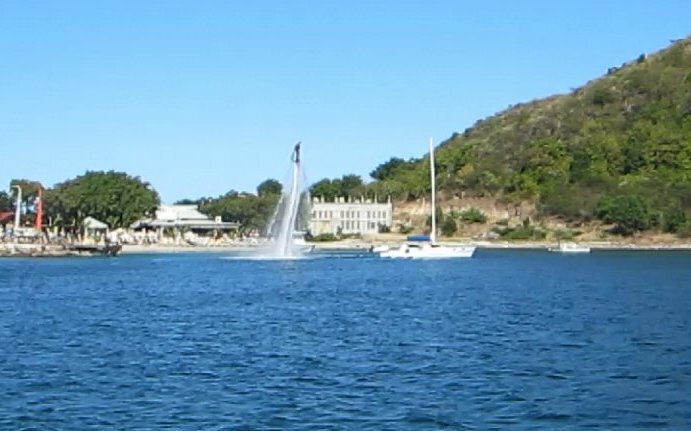 We left the comfort of the marina at Port Zante in St. Kitts for the south of the island at Cockleshell Bay so we could jump off in the morning to Antigua. 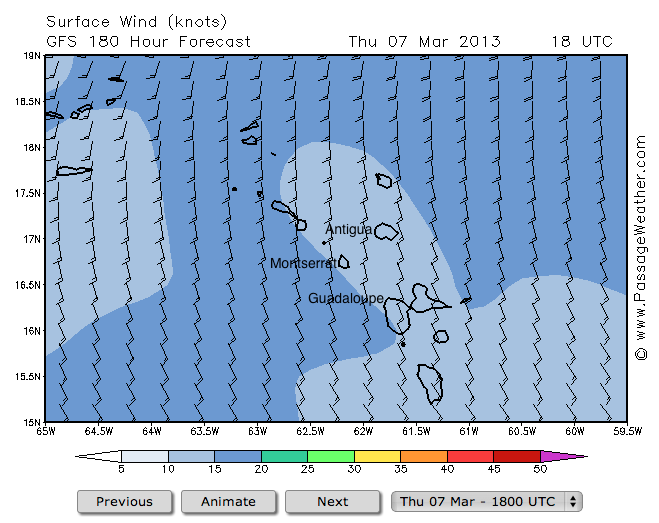 We expected to spend a quiet night in the harbour and head out early in the morning for favourable winds and seas. There is a great beach-bar at Cockleshell Bay called Reggae Bar. So sad... Mmmmmm, bbq pork! 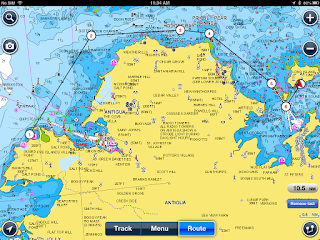 We set anchor, had lunch and took a rest. We thought we would go in a check out the bar in the late afternoon. BUT!!! What did we see??? Someone was trying the fly boarding we had seen only on YouTube. So we watched for hours as newbys tried it out and veterans shot up to the sky and then dove in for dolphin jumps. VERY COOL. It seems that they hook a hose to the back of a sea-doo to provide high-pressure water to the platform. Here is a video of folks fly-boarding. When the bar closed at 10, they shut off their internet so there was nothing for us to do but go to bed to get ready for our 06:30 start to Antigua. 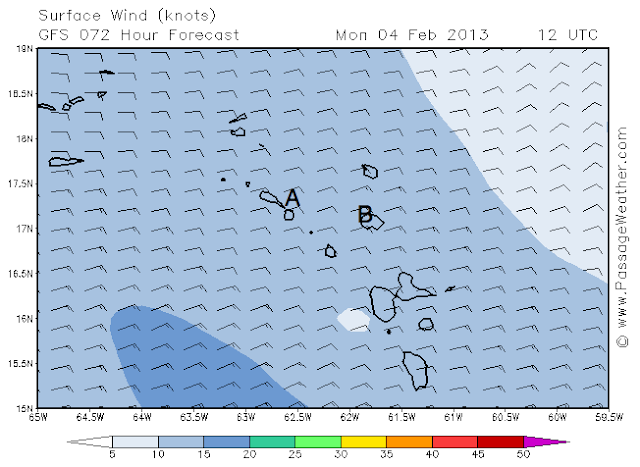 We were expecting (1) low winds; (2) swell from the north; and (3) some north in the wind, allowing us to motor-sail. 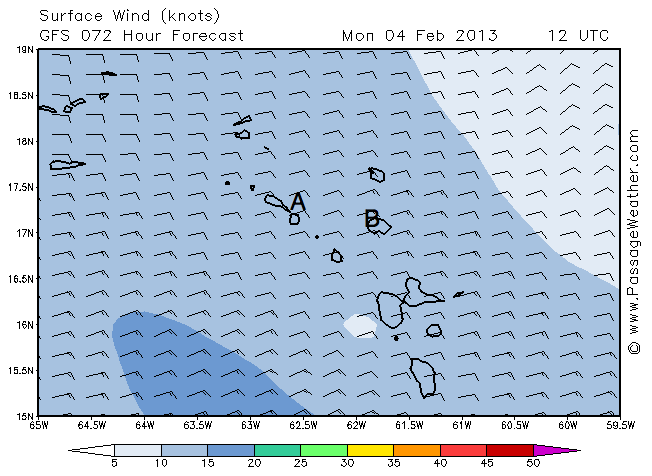 So we got up to a great start… low winds. We headed out and as (1) the winds increased we noticed with displeasure that (2) the waves were on the nose and (3) the wind direction was due east or south of east. Great forecast! But, we dug in and spent 9 hours bouncing around and… arrived in Antigua!!! YAY!!! Had two strikes on the Christmas present lure but no fish. Got in, cleared C&I. A breeze here in Antigua. Very courteous and professional staff. It helped that we had pre-cleared electronically with eSeaClear - the web based clearance system. Very slick. We were met on our arrival by a longtime e-friend whom we had never met… Bobby Ward. Bobby is the Island Packet Wizard. There is nothing IP that Bobby doesn't know and Glen has been exploiting that e-friendship for 4 years… so it was rewarding to finally meet him. We enjoyed beverages on Blue Pearl - cooled by the refrigeration system that he helped Glen install. 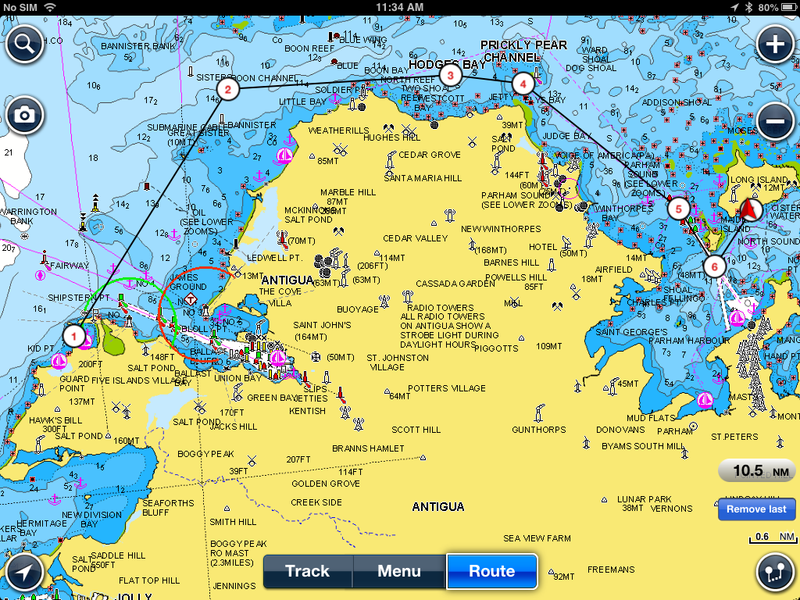 We are going to follow them around Antigua for the next few days so they can show us their favourite anchorages.